Did you enjoy the first Duchess Diaries Book Club selection? I heard yes! If you missed it, you can still order The Digger’s Daughter by Posey Moore Nash here: https://www.amazon.com/Diggers-Daughter-Posey-Moore-Nash/dp/0999590103. Catch up, would ya? Now for the selection for the month of love. It’s a fabulous guide about loving yourself enough to make your life even better and more. More happiness. More accomplishments. More inner joy. More whatever you’re looking for. With instructions. It’s called Tiny Life Changes and it’s written by a pair of sisters you surely recognize: Lauren Daniels, founder of Happily Ever After League and her sister Lisa King of The Fulfilled Pharmacist fame. Yeah–they didn’t have enough on their plates with Lauren running a nonprofit and working as a life coach, and Lisa’s career as a pharmacist and a how-to-live-well-with-food side gig. So they wrote a book. You know, in their spare time. 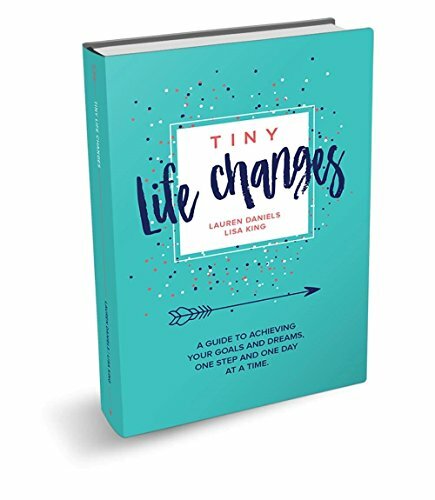 “The idea for Tiny Life Changes came through sister co-authors Lauren Daniels’ and Lisa King’s 45 years experience in health and healing. Lauren is a life coach and founder of The Happily Ever League. During her own cancer journey she learned to take things not only one day at a time but one hour at a time. Staying positive and moving forward helped Lauren keep her mental game strong during her cancer recovery. The book may be little and easy-to-read but it packs a powerful punch. Lauren and Lisa say the most exciting thing is readers telling them the tips and tools work. Interesting right? Amazon delivers overnight. It’s what all The Duchess Dolls will be doing this weekend. Order your copy of Tiny Life Changes here: https://www.amazon.com/TINY-LIFE-CHANGES-ACHIEVING-DREAMS-ebook/dp/B076HHPWLF.